Is your toothbrush increasing your risk for colon cancer? If you use an electric toothbrush, you may be brushing your teeth with harmful bacteria. In fact, your toothbrush could have as much as 3,000 times more bacteria than other toothbrush types. It all depends on how the toothbrush is made. Researchers at the University of Texas Health Science Center at Houston published their study results on this topic in the Journal of Dental Hygiene. They found that in nine out of ten comparisons, toothbrushes with hollow heads had higher microbial counts than those with solid heads. Lead study author Donna Warren Morris, RDH, MEd explains, "Toothbrushes can transmit microorganisms that cause disease and infections. A solid-head design allows for less growth of bacteria." In this study, participants brushed their teeth twice a day with one of three randomly assigned power toothbrushes over the course of three weeks. The participants used non-antimicrobial toothpaste. They flossed as usual but did not use any other dental products, such as mouthwash. The brush heads were exposed to five different types of microorganisms: yeast and mold, oral streptococci and oral enterococci anaerobes, Porphyromonas gingivalis, and Fusobacterium species. While Dr. Morris does point out that there is no current research linking bacteria found on toothbrushes to systematic health effects, some of these microorganisms are linked to systemic diseases. She says, "We do know and there are studies that have linked Fusobacterium to colorectal cancer. Some of these other bacteria have been linked with cardiovascular disease. There is a high association with gum disease and cardiovascular disease. Researchers have been able to culture the same bacteria around the heart that causes gum disease." It seems that it's likely best to limit exposure when possible, especially if you can do so by making a change as simple as switching out the type of head on your toothbrush. Solid-head electric toothbrushes have fewer bacteria on them than hollow-head toothbrushes. So they’re less likely to transmit disease-causing microorganisms. It can be a bit tricky to determine whether a new toothbrush has a solid or a hollow head, as this information typically isn't listed on the packaging. Look carefully at the connection between the head and the body of the toothbrush. While there will always be some space connecting the two parts, a significant portion of it will be solid if the rest of the head is solid. 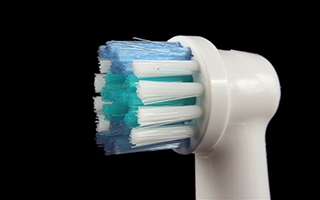 In addition to looking for a toothbrush with a solid head, you should also look for soft nylon bristles. These will prevent rough areas where bacteria can live and grow from forming on your teeth. No matter what kind you use, be sure to disinfect your toothbrush after each use. Soak the head in a disinfectant like mouthwash for 20 minutes, then let it dry out thoroughly. Or you can invest in an electric toothbrush that comes with an ultraviolet light. That will do an excellent job of disinfecting your toothbrush as well. Journal of Dental Hygiene, August 2014.